The changing of the calendar in our home always brings about a little reflection and eager anticipation. 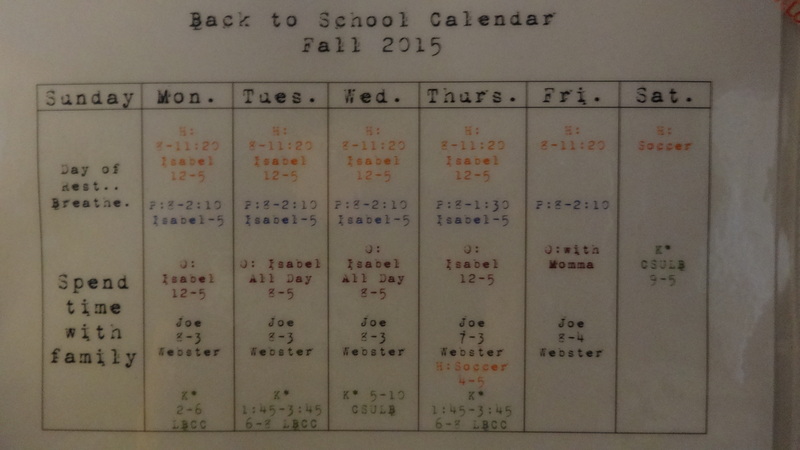 I have a weekly, color coded- semester based calendar. Then I have the month with important dates calendar. Typically September has been a month full of transition in our house with summer ending and school starting. This year was busier than most with Joe’s class, both of the boys starting homework, my classes requiring reading/writing, and my teaching that requires planning/grading. That thankful banner was found in Target’s dollar bin and I am hoping that phrase will carry us through this next season. When we gather around the table at dinner we try to name what we are grateful for. A tiny tradition around our tiny table, training our hearts to stay in a posture of thanks. I also look notice the little reminders: a fruit bowl showing signs of summer having gone before we had our proper good-bye. I like it that way, really. Recently I couldn’t find any ripe nectarines in the market so I reached for pears and apples. I fondly reminisce about all those cooling batches of pear sauce for babies. Now pears are tossed into lunch bags because our house continues to change and grow. I welcome fall. I look forward to a chill in the air, an excuse to drink cider, scarves, and sweaters. The windows are open and we are waiting.